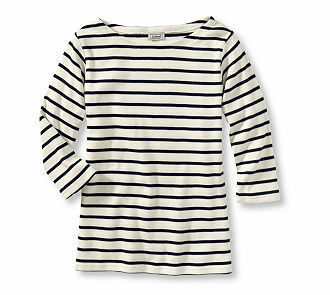 Ok, so I have been pining for the French sailor shirt for such a long time, and I could never find one that looked right. I tried the obvious stores (Gap, Old Navy, J.Crew) just because I thought the striped shirt would be so easy to imitate and any kind of stripe is so hot right now. For some reason some of these stores thought it would be a good idea to modernize it with bright stripes. Blah! I hated the shirts I found. This L.L. Bean shirt for $34.50 is the closest imitation to the actual shirt and much more affordable and easy to obtain. Next Post Meg Ryan loves the French shirt too! OMG! You have found the perfect one! I am so going to pick that up now. Thanks for sharing. What a find!!! I love this shirt…. the strips are just the right size too! I know! I might have to snag one too!